Charles Wood (Illinois State University) presents his project to an audience member. 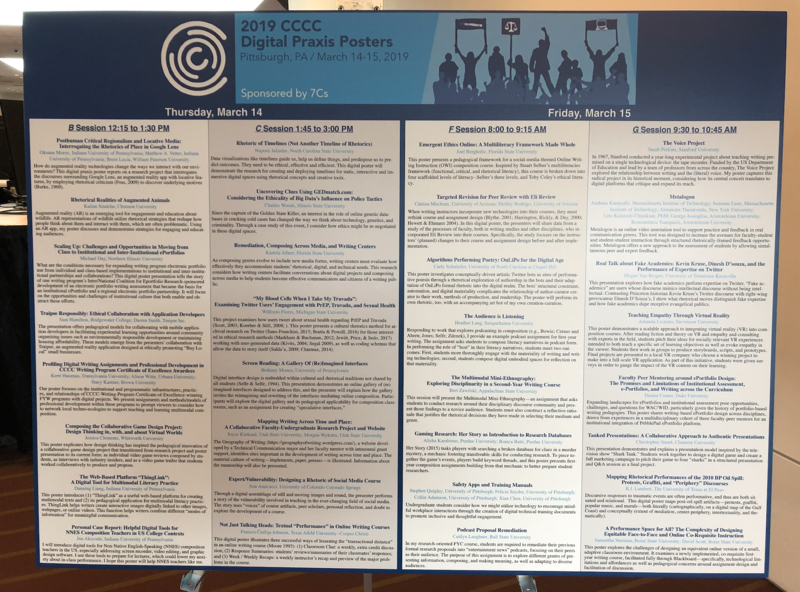 The Digital Praxis Posters sessions (sponsored by 7Cs) have become a staple event at the annual Conference on College Composition and Communication (CCCC). These sessions are typically held in an open area at the conference site where conference goers can simply “drop-in” to listen to a presenter or two on their digital projects. Presenters share their research and pedagogical projects via modes like websites, interactive slideware, audio, video, etc. This year in Pittsburgh, we saw more than 30 DPP presentations (see poster below). In this post, we feature a few of the presentations in which our Fellows have had the opportunity to engage. Abstract: Data visualizations like timelines guide us, help us define things, and predispose us to predict outcomes. They need to be ethical, effective, and efficient. This digital poster will demonstrate the research for creating and deploying timelines for static, interactive and immersive digital spaces using rhetorical concepts and creative tools. 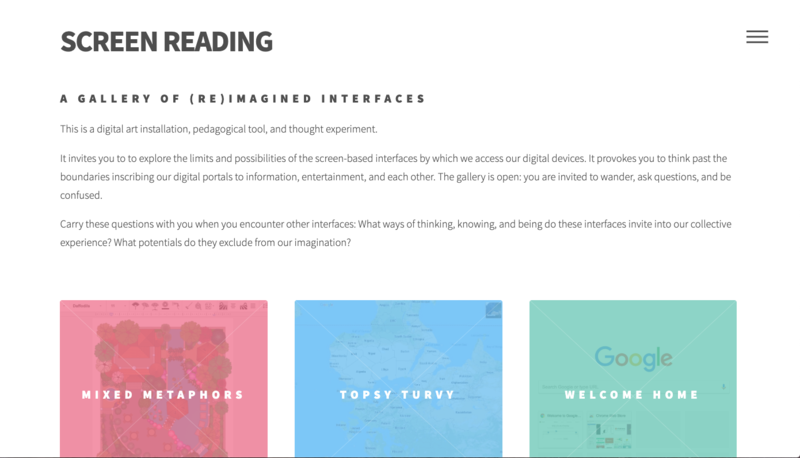 Author’s notes: I created this webtext to provoke inquiry into the hidden aspects of interface design. By defamiliarizing six graphical user interfaces that were familiar to me, I attempted to look at rather than through the interfaces in order to combat the “myth of technological transparency” (Haas, 1996) that prevents us from seeing how interface design can reify dominant rhetorical, ideological, and epistemological paradigms (Selfe & Selfe, 1994). Each one of the six de-familiarized interfaces is a thought experiment that highlights an invisible aspect of an interface that we typically look though, such its hidden metaphors, logical orientation, infrastructural background, or relationship to our bodies. The gallery is also intended as a pedagogical tool, and I hope that it can be used as a discussion starter in a variety of learning scenarios, including courses on digital literacy, digital rhetoric, web design, and media theory. For instructors and students wishing to further these explorations, I have also created a sample assignment sequence that can modified to help students create their own defamiliarized, speculative interfaces, which is available in the “How can I use this?” section of the webtext, and which I have also linked here for easy access. Finally, “Screen Reading” is a work-in-progress, so I would love to know if and how it is being used as I refine and revise it. Feel free to get in touch with me via bmonea@gse.upenn.edu or on twitter @bethanymonea. Abstract: Since the capture of the Golden State Killer, an interest in the role of online genetic databases in cracking cold cases has changed the way we think about technology, genetics, and criminality. Through a case study of this event, I consider how ethics might be re-negotiated in these digital spaces. 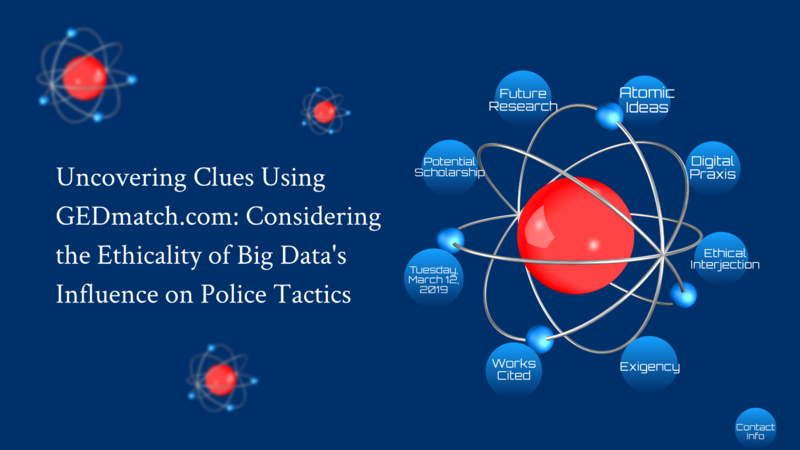 Author’s notes: The purpose of this project is to present an ethical interjection into the conversation concerning the ethical uses of genealogy databases by police and government agencies to catch criminals. Identifying the exigency for this interjection through a case study of the arrest of Joseph D’Angelo, aka The Golden State Killer, and ending with the announcement of charges in the recent case of Theresa Bentaas, this project identifies potential scholarship on ethics and research methods in digital spaces to construct a public ethical framework for users of genealogy databases. The project identifies User Agreements as fruitful sites for analysis to work toward a public ethical framework and calls for more work done at the triangulation of medical rhetoric, Big Data, and consent. 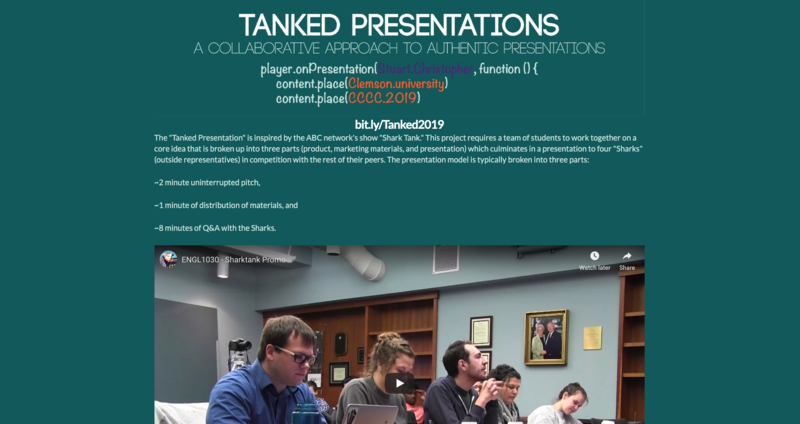 Abstract: This presentation demonstrates and explains a presentation model inspired by the television show “Shark Tank.” Students work together to design a digital game and create a full marketing campaign to pitch their game to four “sharks” in a structured presentation and Q&A session as a final project. Abstract: Augmented reality (AR) is an emerging tool for engagement and education about wildlife. AR representations of wildlife utilize rhetorical strategies that reshape how people think about them and interact with them, which are often problematic. Using an AR app, this poster discusses and demonstrates strategies and problems with engaging and educating audiences within its medium. 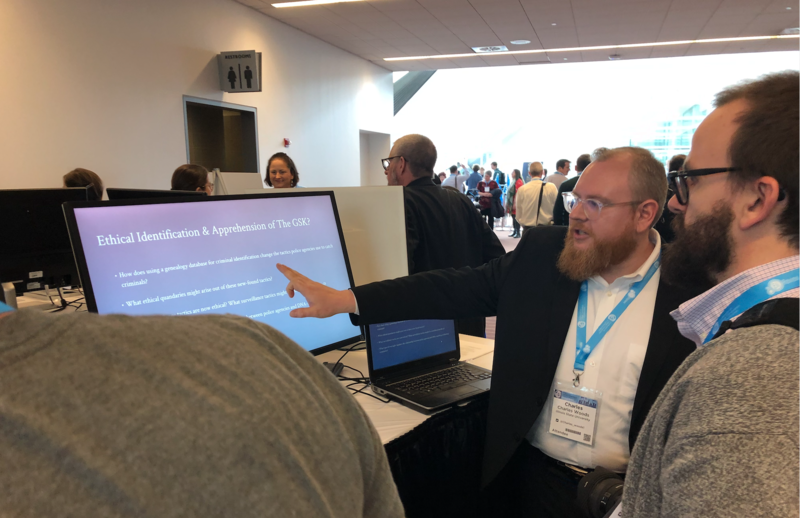 Abstract: This poster presents a social-media-themed pedagogical framework for FYC that has been piloted in both OWI and face to face classrooms. 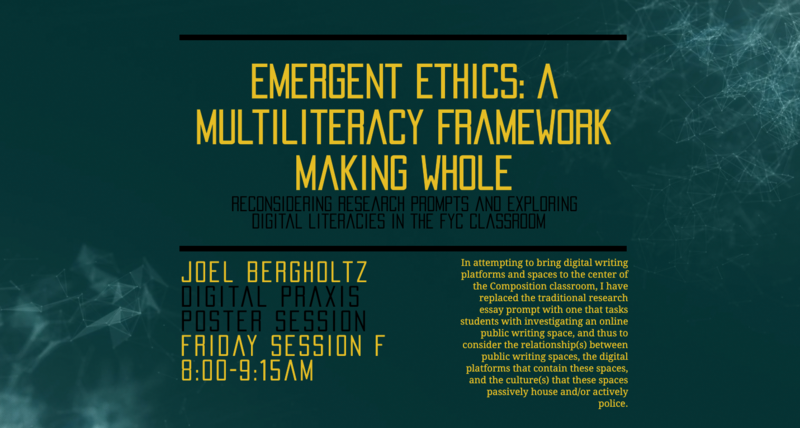 Inspired by Stuart Selber’s multiliteracies framework (functional, critical, and rhetorical literacy), this course is broken down into four scaffolded levels of literacy–Selber’s three levels, and Toby Coley’s ethical literacy. In addition, it includes a rationale for and approach to social-media-FYC that is guided by the WPA Outcomes. Abstract: This video presents a digital assemblage of still and moving images and sound inspired by Alexandra Hidalgo’s digital book, Cámara Retórica. I perform a story of the vulnerability involved in teaching in the ever-changing field of social media. This performance uses “voices” of course artifacts, images from my own social media feeds, and images and video of my local surroundings to explore the development of a Rhetoric of Social Media course for college seniors. 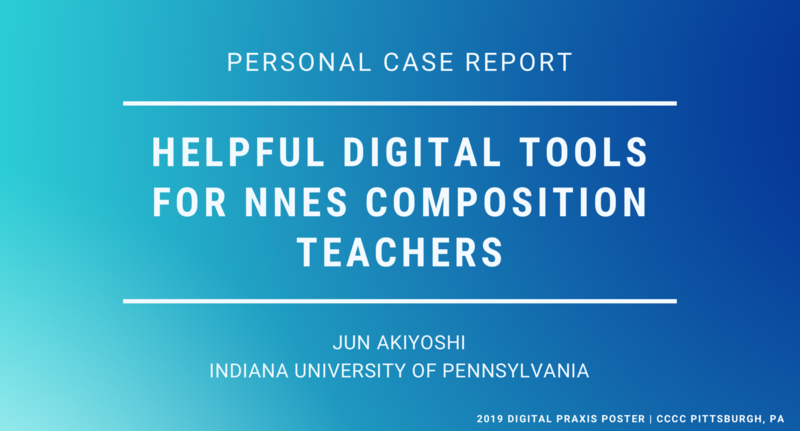 Abstract: I introduce digital tools for Non-Native English-Speaking (NNES) composition teachers in the US, especially addressing screen recorder, video editing, and graphic design software. I use these tools to prepare for lectures, which could lower my anxiety about in-class performance. I hope this poster will help NNES teachers like me.